TORONTO (CP) -- Saying he just "couldn't put on another jersey,'' longtime Toronto Maple Leafs enforcer Tie Domi retired Tuesday. Domi said he has taken a job with TSN. Domi, 36, was becoming a hockey dinosaur as the role of the enforcer decreases while speed and skill are emphasized in the new NHL, rendering the five-foot-10, 210-pound plugger's limited role redundant. The Leafs bought out the remaining season of his contract during the off-season. Domi spent the final 11 seasons of his career in Toronto. He's fourth all-time in NHL penalty minutes with just over 3,500. 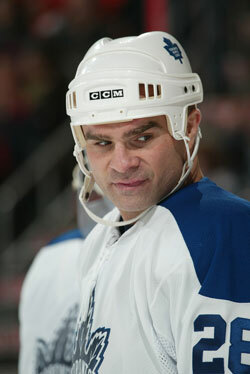 He played 1,020 career games in the league with the Leafs, New York Rangers and Winnipeg Jets. Domi recorded just five goals last season. With fighting down and offence favoured in the new NHL, the Leafs decided it was time to cut Domi loose.